One afternoon in June, Nicole, a Grade 12 student from London was doing circuit lunges with a Grade 9 student as part of a leadership gym class. “As we were moving on to the next circuit, the girl I was paired up with froze with weights still in her hands,” recalls Nicole. Thinking the young girl may have been confused about her instructions, Nicole proceeded to take the weights from her hands. “She suddenly started falling backwards. I did my best to slow the fall so her head wouldn’t hit the ground,” shares Nicole. As she fell, the Grade 9 student started shaking uncontrollably. Nicole will always remember the sight of the young girl in the midst of a seizure. As her teacher, called 911, Nicole checked for the girl’s vital signs. After making sure the student was breathing and had a pulse, Nicole proceeded to put her in the recovery position, placing a shirt under her head to protect it. “I was surprised at how calm I remained,” says Nicole. “I knew I needed to stay calm because that would reassure the student,” she adds. When the ambulance arrived, the young girl panicked, but Nicole reassured her. “I told her everything would be fine, and that they’re just going to examine her.” She stayed by her side until the student was transported to the hospital. When recalling the incident, Nicole admits “I’ve never had to face something like that. I want to be a firefighter and this experience definitely prepared me in knowing what to do.” Later, the young girl approached Nicole to let her know what an inspiration she was to her. “Being CPR trained is so important. If something like this happens, you are prepared and you know what to do,” attests Nicole. “It also looks great on your resume. 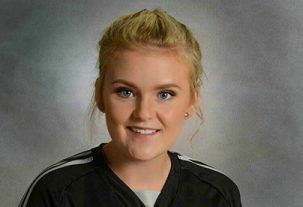 I am taking soccer at Cape Breton University and my program requires me to be CPR certified,” she adds. The ACT High School CPR Program was set up in H. B. Beal Secondary School thanks to provincial partners, the Government of Ontario, Hydro One, and ACT’s national health partners, AstraZeneca Canada, Sanofi Canada, and Amgen Canada. The Advanced Coronary Treatment (ACT) Foundation is an award-winning, national charitable organization dedicated to establishing free CPR and AED training programs in high schools across Canada. ACT raises funds to donate mannequins and teacher training to schools, and guides schools in program set-up and long-term sustainability. Over 3.6 million youth have been trained in CPR by their teachers through this lifesaving program to date.